In Episode 352 of the Iron City Rocks Podcast we welcome Rock and Roll Hall of Famer Glenn Hughes to the show. 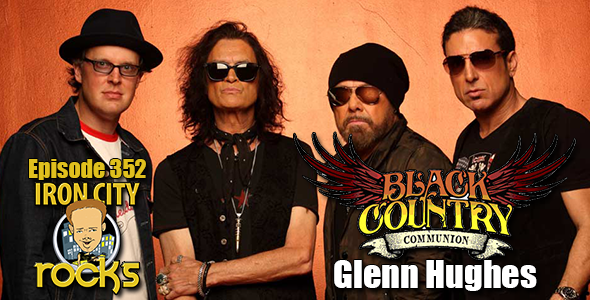 Glenn along with Derek Sherinian, Joe Bonamassa and Jason Bonham will release Black Country Communion’s BCCIV on September 22nd. Glenn talks to us about how he and Joe reconnected and started writing material for the album, working with producer Kevin Shirley, and much more. We are also joined by Bob Kulick who recently released Skeletons In The Closet. The album features a bounty of hard rocks finest including Dee Snider, Bruce Kulick, Rudy Sarzo, Scot Coogan and many more. Bob talks to us about how he finally got to put together his first solo album. We also reflect on the 40th anniversary of Bob’s time on the Bat of of Hell Tour with Mealoaf. Finally with are joined by DJ Bonebrake of the influential punk bank X. X is currently on tour celebrating their 40th year as a band. DJ talks to us about now Ray Manzarek of the Doors ended up producing the band, DJ’s drumming style for rock playing and his jazz work, and the band’s appeal after 40 years.